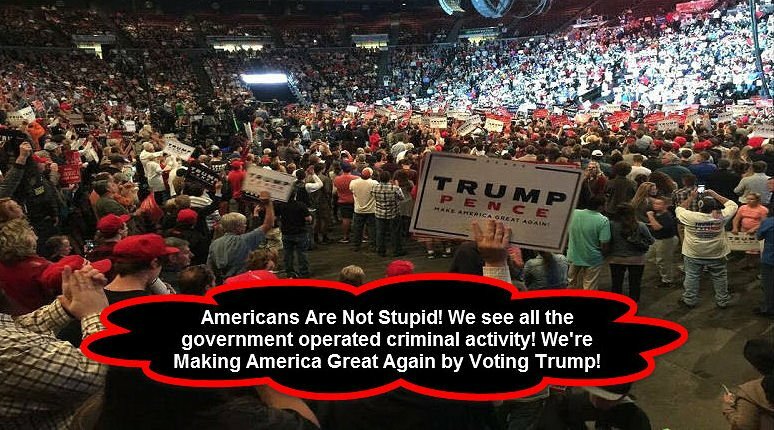 America and Americans are not stupid. Though Hillary Clinton and her owned liberal media thinks we are dumber than a box of rocks. Think again chumps! Thousands of Americans pack in to a huge arena to here their fearless leader Donald J Trump speak. America has witnessed Federal Laws that were broken that are punishable by long Federal Prison Sentences. Crimes that were excused by Loretta Lynch and James Comey just wreak of corruption and collusion. Americans are not idiots that will let corrupt politicians and liberal media lead us around by the nose! Made up lies by the New York Times whois in bed with the Clinton Campaign are a total joke. Fabricated and echoed by a bunch of bought and paid for liberal parrots squawking “look Trump said this. Trump did that” which was spun up to drown out the recent Podesta Wikileaks emails. Michell Obama bashed Donald J Trump like never before. We know she is worried her husband Barack Obama will end up in prison along with Hillary Clinton, when Donald J Trump becomes America’s 45th President. It’s plain and simple – We know what’s going on and it will never work. We’re going to elect Donald J Trump as our 45th president. So stick it where the sun don’t shine! Lookie Lookie Here.. Podesta Emails Part 7 courtesy of WikiLeaks 10/14/16. And this tidbit by ole Bubba himself – Bill “I’m a Pervert” Clinton. And this Juicy tidbit by Fox News! So no matter what lies and falsehoods you try to spin – we’re voting for Donald J Trump 11/08/16. And friends try to somehow document your vote. These liberal assholes will try to steal the election any way they can!